When we discuss the Moon as we have been in each preceding post, it is important to note the Moon is strongest when in the sign of Cancer. The Moon is the ruler of the sign of Cancer. All things related to the Moon are also related to the sign of Cancer. The idea of the Moon representing the Mother stems from the fact that the sign of Cancer is closely associated with the fourth house. The Fourth house is the house of family and home and of course Mother. It represents a part of the chart known as the Nadir or IC. This is the southern most part of the wheel. The energy of Cancer if very domestic, right down to never leaving home. With this said there is also a closeness with mother. Domestic security is very important to this energy. 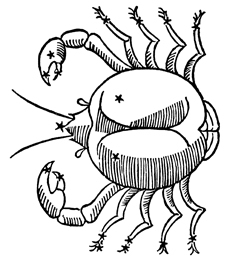 Remember the Moon is emotional security, in Cancer it is even more intense when in the sign of Cancer where the idea of “security” and “support” play a feature role. The emotional sensitivity of Cancer also makes it a very “empathic” energy. Someone with a Cancer moon for example, will be very good at reading the moods of those around them. They could even be called “psychic” or “intuitive.” By the same token, it can also be a very overly sensitive energy causing someone to feel slighted even when there wasn’t anything to feel slighted about. So during a Cancer Moon we all might want to be more wary of misunderstandings due to being overly sensitive. Moodiness will also be a factor associated with Cancer Moon energy. Times when emotionally we are not real stable could be associated with Cancer energy. Sensitivity to the moods of others is also a Cancer energy trait. But if it is day when someone doesn’t feel that great, it is possible to spread that bad moon on a day when the Moon is running through Cancer. Then again it is a great day to spend with the family or with your children if you have them. It is a great day to take on those domestic challenges such as canning vegetables or creating a huge meal. It is a great time to visit your mom, or do something special with her. When the Moon is in Cancer it is time to hang at home and spend time with those who are closest to you. When this energy is excessive there could even be a tendency to not even want to leave home.